Contact the Archives Assistant for general inquiries. Contact the Senior Archivist for information about donating materials, volunteering and internship opportunities, and information about educational programming and public speaking requests. Jennifer serves as Senior Archivist for Hershey Community Archives, where she is currently working on making the holdings of the Archives more accessible by accessioning, arranging, describing, and digitizing materials. Additionally, Ms. Henderson provides reference services for a variety of corporate and public users, and represents HCA at various community outreach events. 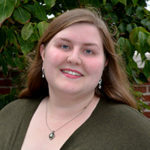 Prior to joining HCA, Ms. Henderson worked for The History Factory (supporting a number of corporate and non-profit clients) and Steelcase Inc. She received her MSI degree with an Archives and Records Management specialization from the University of Michigan, and her BA from Kalamazoo College where she first fell in love with archives. 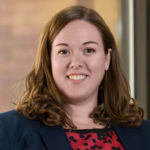 Jennifer earned the Certified Archivist credential in 2013 and is an active member in the Society of American Archivists and the Mid-Atlantic Regional Archives Conference. Tesa has served The M.S. Hershey Foundation since 2015 and began working as Hershey Community Archives’ Assistant in 2017. She provides general reference services, supports the activities of the Senior Archivist, and manages the Archives’ social media. Ms. Burns earned her B.A. in Archaeology from Dickinson College in 2015 and is currently working on her M.A. in American Studies with concentrations in Public Heritage and Gender Studies at Penn State Harrisburg. She has worked in the museum field since 2010 and, in 2017, found her passion for archives. Born and raised on Long Island, New York, Ms. Whitenack served the Hershey Community Archives for nearly 35 years. In 1990, she became Archivist and Director of the Archives. In that capacity she was responsible for managing an active archives serving the corporate and local community in Hershey. She is past-president of Oral History in the Mid-Atlantic Region (OHMAR), and is a frequent presenter at regional and national archival organizations. She is the 2012 recipient of OHMAR’s prestigious Forrest Pogue Award, which recognizes significant contributions to the field of oral history. She is co-author of “Images of America: Hershey”, a pictorial history of the community, published in 2000 by Arcadia Publishing, the author of Images of America: Hersheypark, 2006, and co-author of “Hershey Gardens,” 2017. Ms. Whitenack received her B.A. degree in history from Wittenberg University, Springfield, Ohio and her M.A. degree in American History with Certification in Museum Studies from the University of Delaware. She lives in Hershey with her family. Ms. Whitenack retired from her role as Director of the Hershey Community Archives in February 2019, but will continue to serve as the Oral Historian.